Google has released a new part of iGoogle that basically allows you to customize your own search results. These results are then stored inside your Google account and brought up later on on those particular search terms. There are two things going on here outside of the obvious with SearchWiki. If you discount the fact that it basically customizes your search, and you’re not able to turn it off, there’s one of two things going on. First, it gives Google an advantage of human filtering. While it’s not going to effect the current public searches at this moment, there’s nothing that says that it wouldn’t later on. If you think about it, the human filtering machine is the last step before algorithmic. You can only get so far with mathematics these days, and by context, human beings can filter spam or irrelevant search results much better than a computer after the bulk of the work is done. It’s what another company that we all know should have done with their tool in my opinion. The second that this does, is that it gives creates a interactive search experience. I know that’s not something that most people care about nor is it something that is particularly useful for everyone. But it does give you an idea from an informational standpoint on how people try to game the system. Truthfully, if these results ever show up in the actual searches or have some sort of weight, I wouldn’t be surprised. It also would give an opportunity for people to game the system just as SEO has become such a large part of the Internet market. From a business perspective, there are many good things that can come of this particular tool for Google. Don’t let the ISPs fool ya. Today, they’re in a Senate hearing trying to defend themselves about privacy and ISPs. And they’re pointing their finger at Google. From a technology standpoint, I practically spit out my coffee when I read this. Now, most laypeople do not know that there is a big difference between Google and the ISPs. If you do an analogy in the automotive industry, ISPs are the roads leading from place to place, while Google is merely a vehicle. So as a consumer, you have the choice of vehicles, but you don’t have a choice in what road you pick, since it’s the infrastructure that the vehicle travels upon. So if the ISPs (people behind the roads) decide to toll you, or inspect the contents in your vehicle? Then you have to let them or else you can’t use the infrastructure. There’s no choice in the matter. With choosing Google however, you are actually selecting the vehicle knowingly letting Google look at your contents. You could just as likely choose Yahoo, MSN, or a number of other “vehicles” for your travels. So basically, the choice is between voluntary, and involuntary access to data. And the ISPs are comparing themselves to Google? If the Senate hearing committee buys into this, then you know that there’s something seriously wrong with politicians (or they’ve never learned how infrastructure works). What really got me is this quote on AT&T’s DPI (deep packet inspection) technology. Basically, they have a way to inspect packets and their contents while they’re running through their routers. Nothing super fancy pants, hackers have been doing this for years, but it is hardware. AT&T says it is not doing anything yet with so-called Deep Packet Inspection technology, which lets routers look beyond basic routing information on internet packets to look more closely at what kind of information is being sent, how, and even the content of the packet. Now remember something here. AT&T was also the one that allowed the NSA to put in a totally separate room in their main switching center that would fork off all the data going in and out and then pushed really hard to gain retroactive immunity. The SAME company is now telling the Senate that they’re not going to be invading privacy with this technology? Come on. So sorry, AT&T. But in my opinion, you’ve lost all credibility when you chose to push for immunity instead of facing the consequences of it. You don’t place yourself for consumer rights, nor does it seem like you’d abide by privacy matters anyways. Call it historical precedence. And to wipe the slate clean and start over, is going to take a lot more work than just your word that you won’t be using the DPI technology. As for the comparison with Google? Seriously. ISPs that are trying to make that relationship just made my day. I love Google Browser Sync. In fact, I run this for every Firefox instance on any system that I own. There’s just something about using your Gmail to store the current pages/tabs that you’re reading and the ability to restore when the browser crashes that makes it one of those absolutely needed plugins. It also stores all of your history and bookmarks, browser passwords, and persistent cookies. Basically everything. But there are a few things that drive me nuts still. One is that you can’t initiate a manual sync. There’s no way to actually just tell it to sync up to Google so that you know that there is a copy. There was a number of times where the automated sync didn’t kick in and I had to restore an older copy. Bleh. But that’s not all. It’d also be nice to store different versions of backup. There also has been a number of times where Firefox crashed on restoring the pages. Well, since Browser Sync decided to kick in and sync up the “non-opened” pages, basically lost the tabs. This plugin just has a little ways to go to be fully mature but it’s just a smidgeon off. Until then, I’ll just keep using it and getting annoyed I suppose. Probably nothing stopping me from tearing up Google’s extension and making it better, but you’d think that they’d take the initiative. Ah well. Can’t have everything your way, I suppose. It’s not like Google is Burger King. 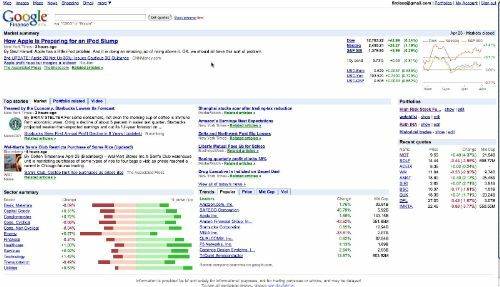 It seems that Google Finance has gone and changed their main portal for the users. At least this morning, my portfolios were all on the left side and tonight it’s on the right side. Now there is more of a market summary section at the top of the page. The middle section is now tabbed out so that it has news from the market, portfolio related, and video. The video section is interesting since it’s basically clips from Google Video. The bottom runs Sector analysis and Trends. It’s actually a lot more informational now, and definitely more worthwhile. Not sure when they were going to announce this, or if they even were going to, but it’s kinda neat. At least it’s been around to help me keep on top of my portfolios. Google has launched Google for Non-Profits. Basically, this site shows you how a non-profit can harness the power of Google applications without much of anything. In fact, my own non-profit is running off of Google Apps. There’s so many amazing things that you can get for basically free which makes having a non-profit all the easier since you can manage everything via Google. Hmm. I have to quit saying the G word. I just mentioned it about five times. I’ve recently been playing with Google Calendar after noticing that any time someone sent me an email with a possible date and time with a location, the right side of the screen would have a “Add to Calendar” link. When I noticed that, I was like…. hey wait a second. Being that my nonprofit organization runs off Google Apps, I started to schedule everything in the nonprofit’s calendar and realized I could do the same with my regular personal account. Then I figured that I’d manage all my items on one single calendar so I shared my nonprofit’s calendar with my personal account and … lo and behold, I had a synchronized schedule book. This was really cool, but wasn’t the end-all-be-all. The last of it was to see if it could handle my day job calendar that was in a corporate Outlook setting. 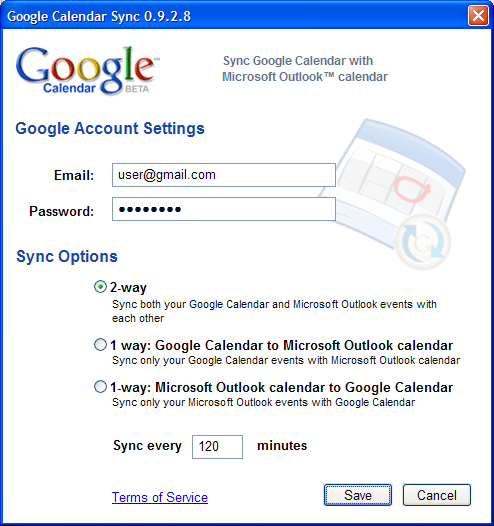 It seems that Google provides a small external application called Google Calendar Sync. I could almost cry that I almost had everything in order. But would it work? It seemed like a fairytale, that everything was too good to be true. And then the mirror shattered. Sorta. Outlook didn’t sync up. Not exactly anyways. In fact, it would only sync only if you created the calendar items in Outlook (not the ones that you’re invited on) especially if your corporate has multiple email aliases. What’s worse is that if you change your primary calendar name, then it refuses to sync together even though the Google Calendar Sync shows up as working. There’s no way to get this to work, and apparently many of the Help group for Google Calendar also ran across the similar issues with enterprise level Outlook accounts. If you export the calendar and import it into Google Calendar, it seems to sync up then which is a strange bug. It definitely is worthwhile to me if I can consolidate all of my notes and schedules under one house. I believe many others feel the same, considering the request for this to be fixed ASAP in the Help Group. But outside of that, Google Calendar seems to be going down a great path if they can address the issues at hand. As of now, Google has in effect let me put my entire schedule for multiple businesses and everything else on one single calendar. There’s nothing like feeling organized again. Google has launched their Ad Manager in a closed beta. I have to admit that this definitely has me intrigued due to the fact that I’m in the business or niche market advertising and am organizing a clearinghouse for a particular market for my business, Five18. Should be interesting to see if they can handle more than one publisher’s site at a time and how intuitive it is to actually manage since the stuff out there currently isn’t all that great from what I’ve seen. I’d love to have something where I can manage both advertisers and publishers at the same time but give publishers as much control as they want over the ads they wish to sell. Advertisers wise, should be able to run their own campaigns based on straight fee structures. So far, the interface seems to be pretty intuitive but it’s more geared towards single sites than anything else. In fact, reminds me a lot of OpenX, which is what I use currently to publish all advertising for the sites on the network. Definitely worth a look when they open it up. JotSpot after being acquired by the giant internet juggernaut, Google, has been reborn as Google Sites. Sites is a part of the Google Apps suite which of course is free for the Standard version unless you want support where then you will have to shell out a hefty fifty Washingtons annually. Having played with both JotSpot and Google Sites, I can say that perhaps the framework is there but nothing else is really. TC even reports the same where JotSpot’s structured templates have been ripped out and now it’s mainly just embedded files from the other Google office suite. In an interview today, Google’s Management Director of Enterprise Matthew Glotzbach called the combined products under Google Apps a “Microsoft Sharepoint killer” because it’s allowing businesses to collaborate without all that expensive Microsoft software. Sharepoint killer? Come on. If you call the integration of a simple wiki, the beginning of Sharepoint killing, you’re sorely mistaken. I admit that Sharepoint has its flaws but it’s a lot more complex than what Google Sites ties together so far. Be it as it may, Google Apps is starting to shift from its fledgling status into a more mature product line. As long as the applications that are provided in the suite stay true on their course to more mature products, there is a good chance that Sharepoint will have a run for its money. As is though, Google Sites barely compares to some of the more feature rich wikis out there. The only great thing about it is the fact that you can do a bit more collaboration and embed Google Docs and such inside it. Otherwise? I for one am not seeing the beauty of it compared to the old JotSpot. Maybe more use will change my mind.